In the heat of June, the only time you can comfortably sit outside is after the sun goes down. By that time, you need a little mood lighting. This easy, pretty outdoor candle holder can help illuminate the evening in the perfect way. 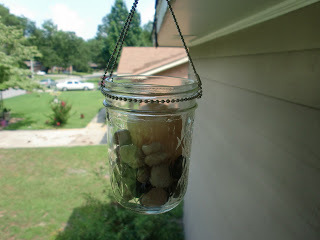 Choose your favorite style of jar and tuck a votive candle into your rocks or shells. Tie your hanger tightly around the mouth of the jar. 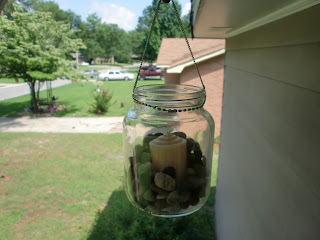 Stagger them around your sitting area and light up the night.